Three rows of fringe... 'nuff said. These classic Minnetonka moccasins make me happy. Transparency. Ok, this is my second pair. I have the shorties too. Full-disclosure. I've worn these with leggings and jeans. I've been getting lots of compliments AND one flag down in the grocery store (where did you get those??). These would also work well in early-summer with vintage Levi denim shorts (late-summer would be a suicide mission) OR tutus :). Haute. Stay Posh! 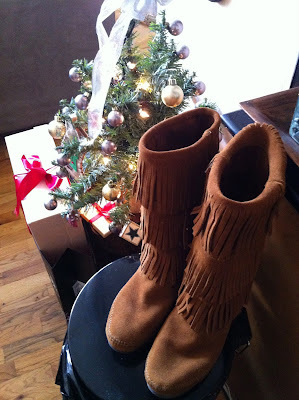 Posh Holiday: 2011 Wish List!